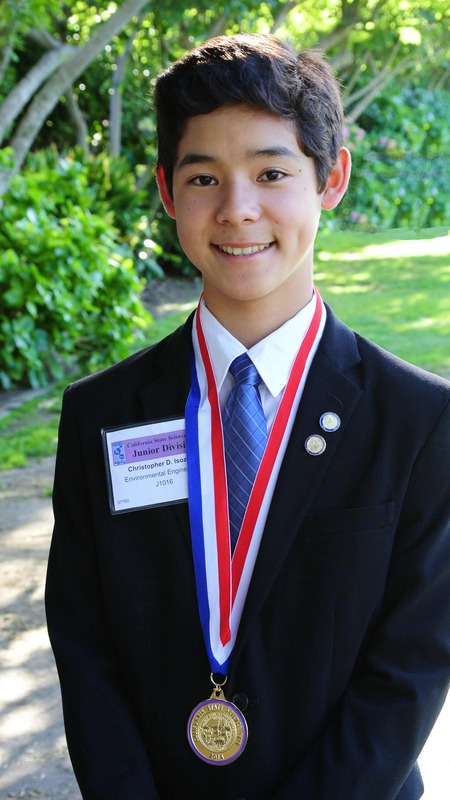 The top 10 finalists of the Discovery Education 3M Young Scientist Challenge, including Christopher Isozaki, 14, of Rancho Palos Verdes, traveled to 3M headquarters in St. Paul, Minn. to compete for the title of “America’s Top Young Scientist” and $25,000 on Oct. 14. Ninth-grader Sahil Doshi from Upper St. Clair School District’s Upper St. Clair High School in Pittsburgh took home the title. The finalists, who traveled from seven different states, were welcomed to the Innovation Center at 3M headquarters by each of their respective mentors. Until then, the finalists had only virtually met with their 3M mentors as they worked together all summer to create a project that can solve an everyday problem. After meeting with their mentors, the finalists were given an exclusive tour of the 3M facilities and finally, began their final challenges. The finalists participated in two challenges before their final project presentations. In the challenges, each partnered with one other finalist to create a variety of inventions to solve specific problems and was then judged by the judging panel. The finalists presented their project that they had been working on all summer in front of a panel of judges that included the 2013 winner of the Young Scientist Challenge, Peyton Robertson, and co-host of Discovery Channel’s “Mythbusters,” Kari Byron. The top 10 finalists ended their journey with memorable presentations and a life-changing experience. For all of their hard work, six of the finalists won a $1,000 prize and a $500 gift certificate to Discovery Experiences. The three runners-up, Katherine Wu, Jai Kumar and Isozaki, won a $1,000 prize and a student adventure trip to Costa Rica. This year’s journey came to a close when Doshi was named America’s Top Young Scientist, taking home a $25,000 prize and a trip to Costa Rica. While Isozaki was an eighth-grader at St. John Fisher School, he participated in the Science Fair. His computer cooling device, which generates electricity by harvesting the heat of the computer, is designed to help save the environment by reducing the consumption of electricity and be economical by reducing energy costs. He was selected as a winner at his school and went on to compete, and win, at the county and state levels. He was inspired by his friend and schoolmate, past winner Braeden Benedict, to enter the Young Scientist Challenge. Throughout the summer, Isozaki worked with his 3M scientist/mentor, Dr. Cristin Moran, to prepare for the final competition. During his experiments, he documented that his cooling device reduced computer consumption of electricity by 32 percent, which exceeded his initial expectations. He shared that he has enjoyed working with Moran and that the entire project has been a great learning experience. He was able to get the project completed while preparing to start his freshman year at Palos Verdes High School, squeezing in time to play basketball and have fun with friends and family. His parents are Dan and Sandra Isozaki, and he has three brothers, Alex, Matthew and Jonathan. He is the grandson of Esther Isozaki. The Discovery Education 3M Young Scientist Challenge is the nation’s premier science competition for grades 5-8.